On this date in 1818, Abraham Casler was hanged in Schoharie, N.Y. for escaping an ill-advised marriage by means of an illicit powder. 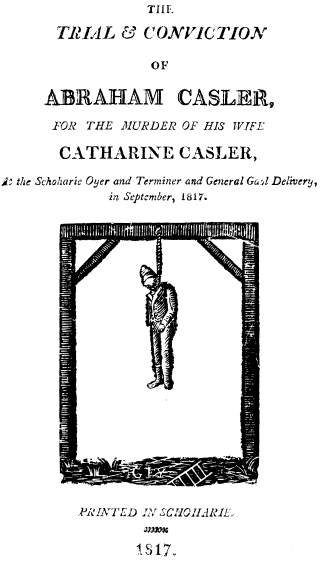 Casler had got young Catherine (Caty) Sprecker pregnant and was only induced to change her name in 1812 by threat of prosecution. Even at the wedding he told the bride’s own brother that he didn’t intend to live with the poor girl. Casler immediately regretted committing himself to wedlock in any form whatsoever (his alternative would have been to pay a fine, much the bargain as compared to an unpromising marriage — particularly so in those benighted days before no-fault divorce). So he promptly enlisted in the army then fighting the War of 1812 so as “not to live with his wife that he wished … was out of the land of the living,” as he said to another recruit. When he finally had to return, Casler preferred to spend his time paying court to a widowed Albany innkeeper, and generally had a manifestly unhappy time of it with Caty. The latter’s epileptic fits probably only exacerbated the unwilling husband’s ire. Doctors who conducted the post-mortem found what they were certain was arsenic and opium in Caty’s stomach. The trial record features a number of these medical men describing the exact tests they used to establish the presence of this deadly mineral; for instance, a Dr. James W. Miller described finding “particles … of a vitrious appearance” in the stomach. Some of those particles were placed on a heated iron; a dense white fume arose from their combustion. Some of them were likewise placed between two plates of polished copper prepared for the purpose; those coppers were bound by an iron wire and placed into the fire until they were brought to red heat; they were then removed and after they were cold they were separated, the interior of the plates were whitened towards the edges of the plate in the form of a circle. He diluted it with a pint of water, then took the nitrate of silver and dissolved it and put into a separate glass; took pure ammonia into another glass; then took two glass rods, wet the end of one of them in the solution of the nitrate of silver, and dipped the end of the other in the pure ammonia, then brought the two ends of the rods in contact on the surface of the water in the vessel containing the contents of the stomach, and passed them down into the fluid; there was a precipitate from the point of contact, that precipitate was of an orange colour. He repeated that experiment several times, and also with arsenic dissolved in water. The results of the experiment were similar; the same precipitate in the one as in the other, tho’ it was more distinct in the solution made of arsenic, that being coulourless. The court record merely summarizes the testimony witness by witness rather than providing a literal transcription, but one gets a sense of the thing merely leafing through it: it has 16 pages of prosecution testimony, from Casler’s Albany crush and family members catching him in suspicious circumstances, plus six different physicians, one of whom was a Professor of Chemistry at Fairfield Medical Academy. The defense has one-half of one page, consisting of a flat denial by Casler and the observations of one former boarder with nothing useful to say. The jury took two hours to convict. That admonition had to be repeated: less than a year later, the crossbeam that had once supported Casler’s dying throes was tested again to dispatch a farmer from Sharon Springs who had bludgeoned a deputy sheriff to death. * “It would only make a bill of expense,” Casler said of the prospect of summoning a physician for his wife. This was also the same disquieting answer he gave when asked if he would be taking the body to bury with her family; instead, he unsentimentally buried it at the nearest available spot, where it was soon exhumed by suspicious locals. The guy hung himself with skinflintedness.